Katherine is 4. She has not been an easy youngster. Her mom does not like to compare kids, but it is hard not to! Her brother is easy to get along with, excited, and energetic. She expected to have arguments with Katherine about doing a chore or task, but she ends up having an argument with Katherine about doing something fun! Katherine's first response to almost any activity is "No, I don't want to". Her mother has learned that if she can get Katherine out the door and to pre-school, for example, she does quite well once she is there. That is, as long as everything is going her way. It does not take much of a problem for Katherine to lose her temper. Two days ago she was called to preschool when another boy bumped Katherine and she dropped her cheese and cracker on the carpet. Katherine belted the youngster and screamed "I hate you, I hate this place, I hate it!" until her mother came. Of course the next day she was back again and things were going alright. Katherine's mother has some unusual memories, or at least she thinks so. She remembers last fall when they took Katherine horseback riding for the first time. Katherine's face showed true joy for a whole hour. Her mother did not know whether to cry or not, as she could not remember such an expression on her youngster's face before for more than a few moments. That memory makes her hopeful that somehow she can bring that joy back to Katherine. It is not an easy task. The combination of being irritable and oppositional tests everyone's patience. She did not realize how stressful it was until she started bringing Katherine to a babysitter so she could go out and visit her friends. Finally she did not have to be thinking about how to keep Katherine from losing it every minute. She is finally coming to the decision that try as she might, she cannot make Katherine's life as smooth as Katherine wants it. Tommy is 11 years old. Tommy spends a lot of time in his room doing legos and making models. Then, all of a sudden there is a scream and stuff gets thrown around. If his parents are so unwise as to go up there, they will get to hear Tommy say that he hates this world, hates legos, and hates this stupid model. Then he will usually look up and say something awful to his parents. That is why they just leave him up there. He comes home from school crabby and throws his homework down and goes up plays in his room. His parents realize that he needs to get out and do something, but the only thing they can ever get him to do is go lift weights at the YMCA. Tommy's father has absolutely no interest in lifting weights, but he has done a pretty good job of convincing Tommy that he likes to go. That gets him out of the house about three times a week. As far as playing with other kids, unless his cousins come over, he won't play with anyone. His parents used to ask why and the answer was because no one likes me. Sad to say, it is not hard to figure out why Tommy would have that idea. When a friend comes over, he is so demanding and insists that the youngster do things just the way Tommy wants. Usually Tommy ends up sulking part of the time when he doesn't get his way. So now, his mom invites friends over for Tommy, but she plays right along side of the friend and Tommy. At least they aren't scared off that way. At school, it is even worse. Everyone seems to know how easy it is to get Tommy to lose his temper. It happens almost every day. He bangs the desk, takes a swing at someone, swears, or kicks them. He is usually caught, and since he is so irritable anyway, the teachers hear a fair amount of defiance. Amazingly, he does pretty well in school once he gets going on something. This year he has changed classes. His old teacher was humble enough to admit that Tommy had pushed her too far and she could not take it any longer. She said she just could not remain professional. Tommy's mom knows how that could happen. Sometimes she just takes off for a walk when Tommy is driving her nuts. She knows she shouldn't leave him alone at home, but she figures if she doesn't go out in the woods for a walk there would be far greater dangers awaiting Tommy at home than if he was there alone. Tommy mostly wishes people would just stop bugging him. Once in awhile, right before bed, Tommy will ask him mom if it hurts to die or what it is like to be dead. She can't tell if he means it or is just saying that to bug her. She is afraid to even think about it. Jeremy is now 18. Things are going great for Jeremy this year. He is back in school, off drugs, and actually is getting along with his parents. In fact, he actually missed them when they went away. He has been helping his Dad put up dry wall after school. Both he and his parents are grateful for his recovery, but they wished they could have picked it up earlier, like when he was 12 or 13. That's when things really started to get worse. Jeremy had always had a hot temper and still does, but then it was unreal. At age 12 his parents would not let him go to a dance. He broke all the windows in their car. He lasted two months in 8th grade before he was suspended for fighting. Jeremy lost the few friends he had by getting kicked off the hockey team. He swore at a judge during a probation hearing and got two months in the Youth Center which was extended to six months after he tried to attack a guard. All the while he was so irritable and never happy. When he came home from the Youth centre he wanted to be able to drive. They said no, and he decided that was it and went out to hang himself in the barn. His parents still remember those words, "You'll all be f-ing better off without me and if you come after me I'll f-ing kill you, too". That horrible day was the turning point. It took five cops to get him to go to the hospital. It took a careful evaluation to figure out that he wasn't just oppositional, stubborn, and hot headed. He was very depressed, too. Now after 6 months of medical and non-medical interventions, he is 100% better. Jeremy admits that if he had to go back to living the way he was, he'd start thinking of suicide. 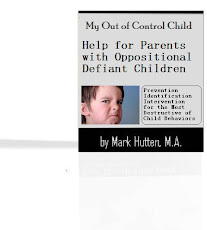 These examples show how very difficult the combination of ODD and depression can be for the family and the youngster. Often the depression gets mixed in the midst of dealing with the aggression and defiance. I commonly run across kids like Jeremy who have been oppositional and depressed but no one ever notices the depression until they make a suicide attempt. Looking for depression in ODD children is very important.